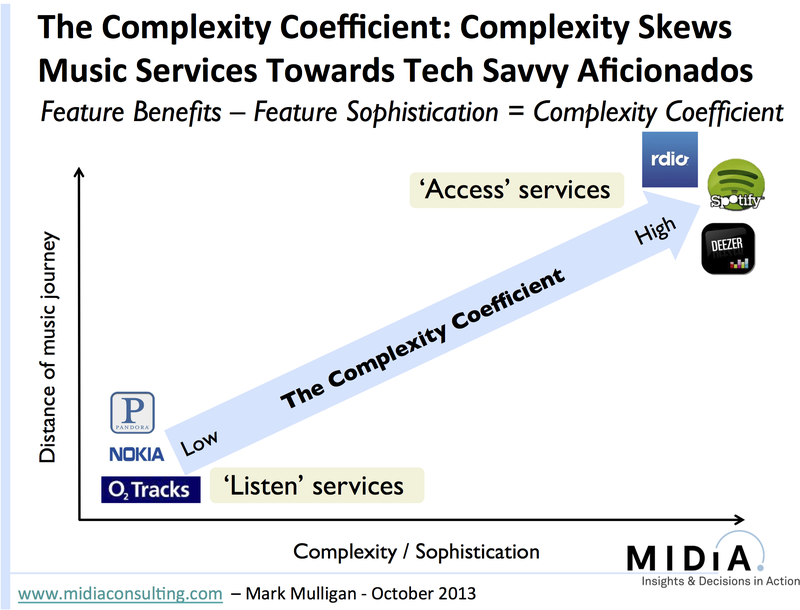 This entry was posted in Ad Supported, Music Discovery, Music Strategy, Paid Content, Spotify, Streaming, Subscriptions and tagged Access Services, Complexity Coefficient, Deezer, Listen Services, Music Discovery, MusicQubed, Nokia, Nokia Mix Radio, O2 Tracks, Pandora, Rdio, Slacker, Spotify, Streaming, Subscriptions, Tyranny of Choice by Mark Mulligan. Bookmark the permalink. Hey Mark, interesting article as usual! However I don’t really agree with the “tyranny of choice” argument. The more choice the better as long as people can find what they want. I think Spotify for instance actually does a good job of helping people finding the music they want to listen to : 1) the search is (almost) as easy as searching Youtube or any search engine (eventhough there are still some improvements to make I agree) 2) the discover / recommendation tool works quite. The main thing for me is that people who want to listen to a lot of different artists / albums can do it and discover new music. People who just want to listen to few artists they heard on radio can also do it. It is also important to question the assumption that we all know what we want a priori. Sometimes we realize what we want afterwards; for example, one might respond negatively or disinterestedly to a recording at first, or based on its description without even hearing it yet, and later come to love it as a favorite. This is why curation/tastemaking, “radio” programming, or what used to be called simply being a DJ (when DJs had a say in what they played), is important. It introduces listeners to music that they not otherwise have even given a chance. Not all creative works give immediate gratification; many require repeated listening to reveal their depths and charms.